Diageo’s leading Scotch whisky brand, Johnnie Walker, has unveiled The Gold Route – the second blend in its Trade Routes Series, exclusive to duty free stores. Like the other blends that make up the collection, it pays tribute to the travelling heritage of the John Walker & Sons family and agents. The Johnnie Walker Explorers’ Club Collection - The Gold Route takes inspiration from the journeys made by the family and their agents from Central America through the Andean mountains, passing the Inca pyramids and along the coast of the Pacific Ocean. “We took inspiration from the richness of flavours, sights and experiences of Latin America to help us select the most precious liquids for this blend,” commented master blender Jim Beveridge. The first release in the collection, Johnnie Walker Explorers’ Club Collection - The Spice Road, which launched in November last year, is an evocative expression of the vibrancy, aromas and spices in the markets around Asia. 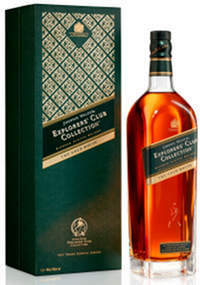 The third release in the Trade Routes Series - Johnnie Walker Explorers’ Club Collection - The Royal Route will be available later in 2013. The blends have a RRP of US$95.